Without football, there is no telling where Vontae Diggs would be today. Hailing from Downers Grove, Illinois via Englewood (Chicago), one of America’s most dangerous neighborhoods, to graduate from college is in and of itself a surprise. With what he’s been through, for him to do it in just three-and-a-half years, is an utter miracle. Diggs has seen it all. He shared stories throughout his UConn career of his childhood and they included anything you can think of in life. Good or bad, Diggs has seen it or been a part of it first hand. There was homelessness, living in the back seat of an Oldsmobile with his mother and brother. There were street fights that he became involved in for no reason other than to satisfy an uncontrollable rage. While his mother returned to Englewood for a new job, Diggs begged her to let him stay with a family in Chicago’s suburbs who took him in, for fear he literally wouldn’t survive back in the city environment. It was an emotional time for mother and son, but she realized there wasn’t really a choice to be made, as it meant the ultimate well-being of Vontae. So ultimately he landed at the home of two friends, Tony and Andrew, who’s parents, John and Nancy Zea, recognized the need for stability in his life. There, he thrived, getting better grades, turning his life around and earning multiple college scholarship offers. 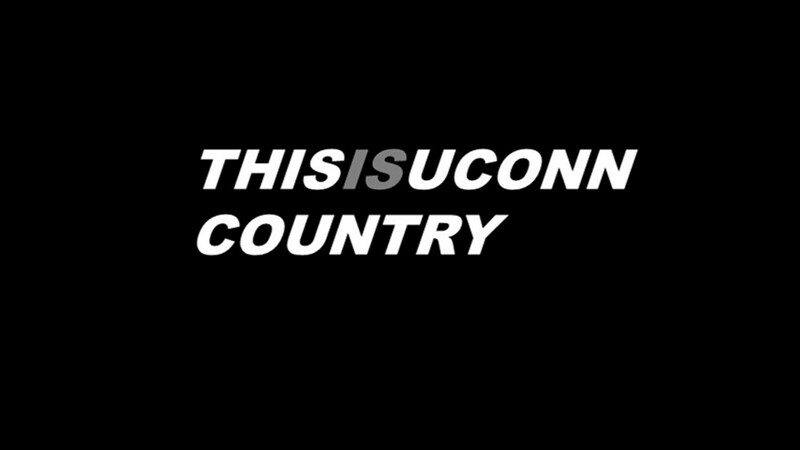 Since getting to UConn, those that have been around Diggs and have experienced his personality over the course of his career know he’s a different breed. It’s evident he cherishes every moment, taking nothing for granted, knowing where the alternative could have led him. 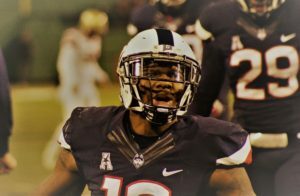 Throughout the ups and downs on the field with the Huskies, he was always upbeat, always willing to share his story and he did so with a smile on his face, seemingly thankful for the present. He’s been through an entire life’s worth of experiences in just over twenty years and has gotten through it because of a sport that has seen a lot of scrutiny in recent times. What ultimately led him to change? “One day, my high school coach, Coach [John] Wander, sat me down and told me, ‘you have what it takes to make it at the college level, you just need to stop BS’ing and stop doing the things that you’ve been doing,’” Diggs said. He then got his first offer from Toledo and it hit home that a scholarship and college was a realistic possibility for him. Diggs hopes to continue to be able to help his community and it was through honing his leadership skills over the last few years, that will aid in that endeavor. He also wants the game that helped shape and make him who he is today, to play a part. Diggs hopes his natural ability to connect with kids will aid in that pursuit and he points directly to his own turnaround and development as to why he’s a believer in what he wants to do. Miracles happen and Vontae Diggs is living proof. These days, Diggs is back home in Illinois, getting ready for an important Pro Day in Storrs on March 21st. TC Boost is a highly respected training facility where several NFL players have gone to bring their games to another level. Rashard Mendenhall, Napoleon Harris, Justin Tuck, Brandon Carr, Sherrick McMannis, Charles Tillman and countless members of the Chicago Bears have called the facility home during their offseasons’ over the years. For Diggs, training ahead of Pro Day is of utter importance. It’s an opportunity to prove himself to a large number of professional scouts, particularly after he struggled through a senior season that limited him from the start. Jackson excelled for the Wildcats this year and went down in the Big Ten record-books as only the second back to gain at least 1,000-yards in each of his four seasons, the other being Ron Dayne. He also went down as the all-time leading rusher in Northwestern history. Diggs being able to compete with him on the level, is promising. He also recognizes some of the limitations that plagued him over the last year and is working with his trainer, Tommy Christian, to correct some of those issues. It’s an effort to make him standout on Pro Day. His agent and trainer, who is respected across the league, has had conversations about Diggs on his behalf. With over a month left to finish preparations, he still has some things he wants to work on. 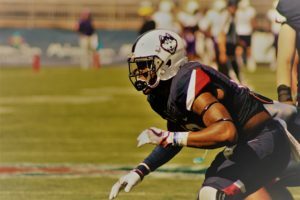 Coming to UConn from Chicago, Diggs started anew in Storrs. He quickly grew close to teammates and coaches, searching out people he could rely on and he found plenty that fit the bill. “Getting to college, a couple guys, Marquise Vann, Cam Stapleton, who is only a 5th year, they helped me a lot,” he said. He also pointed to his incoming recruiting class holding a tight bond that helped him adjust as well. 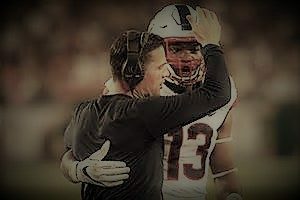 That work with the playbook gave him a deeper understanding of the game and it also let him expand his reach with some of the younger guys on the team. It turned him into a leader. 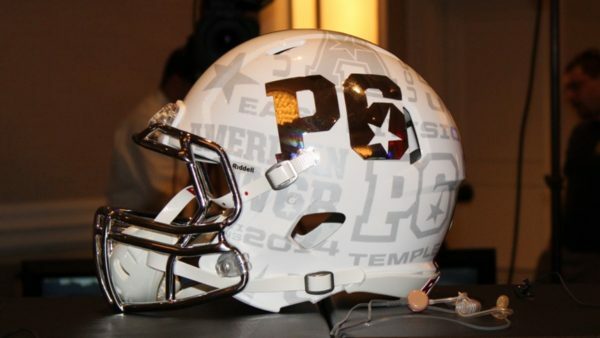 That carried over to this season with head coach Randy Edsall. Once Diggs went down and needed surgery on his knee during training camp, he knew he still needed to help out in any way he could. It’s only been just over a month since leaving UConn, but he’s already missing his former teammates. 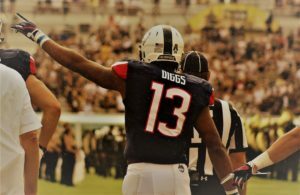 When the topic switched to reminiscing about the best moments he experienced at UConn, both on and off the field, it’s no surprise what Diggs mentioned was his favorite in between the lines. Undefeated team, ranked, bowl eligibility on the line for a program that hadn’t made an appearance in the postseason since January 1, 2011, at home, it’s an easy choice. It’s also no surprise what he said was his favorite off the field, an opportunity to give back in the community. 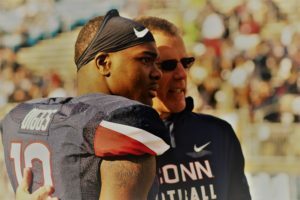 Looking back on his senior year, Diggs felt the team didn’t come close to their true potential, closing his career with a 3-9 record in his final year at UConn. During the transition between coaching staffs, Diggs recognized there’s more the group, the players themselves, could have done in order to have seen more success on the field a year ago. He had one last message before we ended.